I never hang candy canes on the tree because I fear my kids will eat them when I'm not looking. And today my suspicions were confirmed. 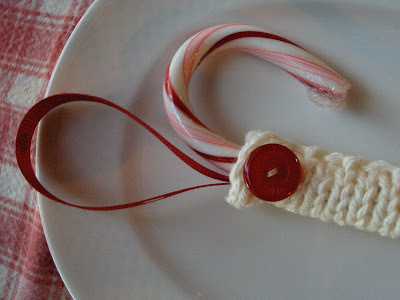 I hung this candy cane cozy with a candy cane in it on the tree. Later in the day I noticed there was a chopstick in its place. You read right, a chopstick! My four year old made the old switch-a-roo. As if I wouldn't notice, LOL. So you see, they actually serve a purpose, if there's an empty cozy then you know someone ate a candy cane. 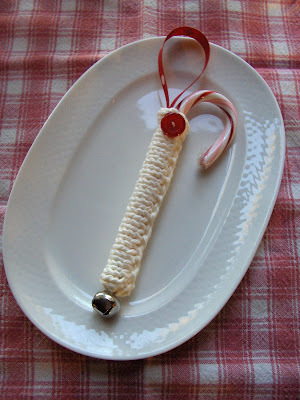 Today I got the idea of making this candy cane cozy/ornament. You can hang them on your tree or give them as little gifts. They only take about a half an hour to make. Directions below. With Size 6 needles cast on 20 stitches. my piece measured 1 1/2" by 5"
Fold in half length wise, and sew seam. 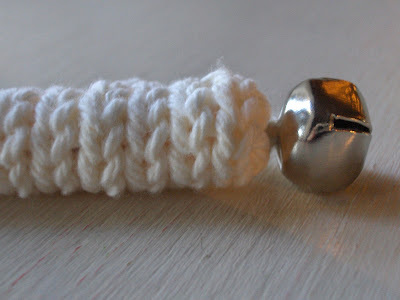 When sewing the bottom closed, use the yarn to add the bell. With thread sew the button on the top. Fold ribbon in half and sew into the inside of the cozy. This is a little tricky because the opening is so small. So as Tim Gund would say, "Make It Work". Oh. My. God. So freaking cute, and the story about the missing candy cane and the chopstick? HYSTERICAL! You can't even get irritated at a kid like that, that is so funny and amazing and inventive! That is really cute. I don't knit, but I think I'll have to see if I can whip up a crocheted one! aww so cute and the story is sdo funny! Wish I could knit. I love love love this. What a fun and unique idea for the holidays. I need to learn to knit. That is so cute! 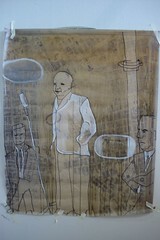 And I love that you have channelled the mighty Tim in making it work! Neat...but If i want to take the cane then I cant make a case. Darn it- I can't remember who I am on Blogger! I had to say something though, even at this late date. These cane cozies are too great. 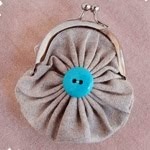 Just an idea...sew in the ribbon before you sew the cozy closed! I love them, thank you for sharing, something so simple , it takes a creative mind to think it up! Thanks for suggesting to sew in the ribbon before hand. Makes perfect sense. Why didn't I think of that? Chopsticks?! Hmmmmmmmmmmm.....sounds like something my resourceful DGDs might cook up. But the sticky unwashed faces would give 'em away. Very clever quick pattern and darned nice embellishing! Verrry adorable. Thank you so much for sharing. 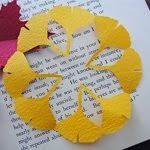 My SIL sent me this link and I LOVE this idea and I'm making her some as a surprise. Thanks so much for the idea, it's brilliant! I've blogged about it and gave you credit and I'm gonna share the pattern with some knitting friends and send them to your blog. Again, Brilliant! I just came across this pattern on Ravelry while searching for Christmas gifts. I've queued this. These are adorable! 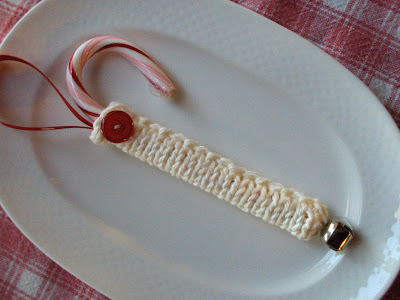 I was wondering though if you have tried sewing the ribbon on before sewing the Candy Cane Cozy together. It seems like that would be the easiest way to do it since the opening is so small. Thank you so much for this!! Too cute!! I am unemployed and everyone is getting this for xmas :) One note: I find it easier to sew the button and ribbon in before sewing the seam. How absolutely adorable! I'm always trying to find inexpensive ways to give something to my fellow co-workers that doesn't break the bank....except for the bells, I have all on hand! Thank you for sharing! So great! Thank you for sharing this. I'm gifting one each to the preschool teachers this year. Happy Holidays! 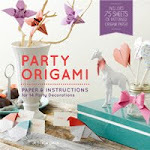 I start looking for new Christmas projects in the summer and came across this one. I've been working on ornaments for a while and these are going to go so well with them! Thank you so much for having posted this, I'm excited about them.